The theme for the 2018 World Dairy Summit was "Dairy for the Next Generation! ", representing a shared determination to rise to new challenges and advance the dairy industry. The event was based at the Daejeon Convention Centre (DCC), opening on Monday 15 October and featured a Leaders’ Forum, IDF Forum, 9 conferences, and 3 special sessions over the course of four days. The evening lineup included a Gala Dinner and themed events like a National Day and Farmers’ Dinner. In addition, a number of Technical Tours were held on Friday, 19th October. 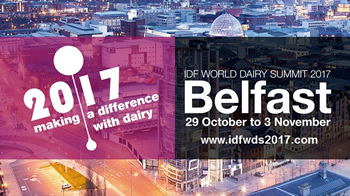 The UK dairy industry brought together the global dairy community to focus on how to Make a Difference with Dairy at the International Dairy Federation (IDF) World Dairy Summit 2017 in Belfast. Organised by UK-IDF, the UK National Committee of IDF, the 2017 event took place from 29th October to 3rd November 2017 at the Belfast Waterfront conference centre. Over 1,000 dairy experts from across the globe gathered in Belfast to share their in-depth knowledge of dairy and bring the audience up to speed on the latest developments in the industry. The theme of the Summit was "Making a Difference with Dairy" and it examined the impact a vibrant, efficient and sustainable dairy industry, with nutrient rich and innovative dairy products, can have on the health of current and future generations, animal health, dairy science and technology, the environment and much more. It featured eight conferences focusing on marketing; nutrition and health; dairy policy and economics; dairy science and technology; food safety; farm management; animal health and welfare; and the environment. The event also included several high profile sessions, including the IDF World Dairy Leaders’ Forum and the IDF Forum, as well as a series of technical tours showcasing the UK industry’s state-of-the-art infrastructures. Dr Judith Bryans, Chief Executive of Dairy UK,, was elected President of the Intern at in al Dairy Federation at the World Dairy Summit held in Rotterdam. Judith takes over from Dr Jeremy Hill of New Zealand, who has completed his four-year term, having been elected at the 2012 World Dairy Summit in Cape Town. The 2016 International Dairy Federation (IDF) World Dairy Summit was held in Rotterdam, the Netherlands from 16-19 October followed by two days of optional technical tours. It had the theme "Dare to Dairy" and looked at how dairy can sustainably contribute to feeding 9 billion people. This year’s International Dairy Federation (IDF) World Dairy Summit was held in Vilnius, Lithuania from September 20-24. The theme of the Summit was “Closing the Nutritional Gap with Sustainable Dairy” and saw the event return to its traditional format of business meetings followed by three full days of conferences, covering nine different topics (including Dairy Policies and Economics, Nutrition and Health, Animal Health and Welfare, Dairy Farming, Marketing, Environment and Dairy Science and Food Safety). Another strong reason for attending was the World Dairy Leaders Forum, which provided the opportunity to hear the views of some of the key players in the global dairy sector. Newsletters were issued daily, highlighting the key events of the day, and these can be viewed/downloaded below. With the theme of "Rediscovering Milk", the 2013 Summit reflected the dairy sector's ongoing commitment to help consumers and everyone in the dairy chain to both discover and rediscover the value of the industry and the nutritious products it produces. Besides a full programme of conferences, covering current issues such as balancing food supply and demand, animal feed, the environment, energy, prevention of animal disease and improving animal welfare, the Summit also featured the IDF Forum of Dairy Leaders as a well as a number of technical tours.